As the oldest of four children, I enjoyed a lot of attention from my mother, especially as a young boy. So many precious memories flood my soul as I think about my mother. She was used of God to plant the thought in my heart that the Lord had a special purpose for my life. She expected me to always put forth my very best effort. When I was just a child, my mother spoke with me often on a wide range of subjects. She gave instruction on everything from steering clear of bad habits to what colors matched in the clothing I wore. Certain words and expressions were never allowed to come from our lips. For example, we were never to use the word fool or the expression, shut up. We were always to answer adults as sir or ma’am, and of course, we could never talk back to an adult. Respect was very important. Mother taught us that we were special, and while other children might be allowed to run wild, her children were going to do right and honor God. My mother was far from being a perfect woman, but she loved her children. She knew that God gave us to her, and she spent time teaching us to do right. A few years ago I wrote a little book, What Every Mother Must Teach Her Children, and dedicated it to the memory of my mother. It is my prayer that the influence my mother had on me will be a blessing to you and your family. 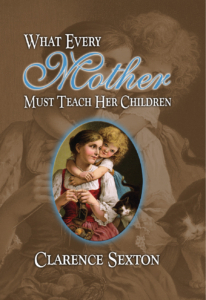 Click here to purchase your own copy of What Every Mother Must Teach Her Children directly from the Faith for the Family bookshop.